They are Individually hand printed and ideal for lunches, collections of small toys. A few years ago I started manufacturing jute bags with simple images of animals, birds, trees and flowers, having been unable to find one without a company logo or corporate statement printed on it. Now I have more than sixty images in my collection. When my niece asked me to print her a bag for her lunch I decided to stock these little bags too. I have created a whole new set of designs to fit the smaller print space and feature some of the animals and insects that are likely to be seen and loved by children. My niece said ‘It’s a bag just like mummy's’. However I was surprised to find that I sell these bags to adults too. It turns out they are perfect for lunches or collections of small items like embroidery silks or buttons. My bags have the highest ethical and environment standards, are biodegradable and have ‘climate neutral’ status. They are shipped rather air-freighted and the people that harvest & weave the jute are paid a fare wage and have good working conditions Once I have created a design, I cut a stencil and then I print each bag individually. This means they are never actually identical and may differ slightly from the one pictured. They are then, individual little works of art! These little jute bags are light but very strong and stand up unaided which makes them perfect for children to fill and empty. They are Individually jute bags and ideal for lunches, collections of small toys, or as an alternative to wrapping paper with out the land fill. A few years ago I started painting jute bags with simple images of animals, birds, trees and flowers, having been unable to find one without a company logo or corporate statement printed on it. Now I have more than sixty images in my collection. When my niece asked me to paint her a bag for her lunch I decided to stock these little bags too. I have created a whole new set of designs to fit the smaller print space and feature some of the animals and insects that are likely to be seen and loved by children. My niece said ‘It’s a bag just like mummy's’. However I was surprised to find that I sell these bags to adults too. It turns out they are perfect for lunches or collections of small items like embroidery silks or buttons. My bags have the highest ethical and environment standards, are biodegradable and have ‘climate neutral’ status. They are shipped rather air-freighted and the people that harvest & weave the jute are paid a fare wage and have good working conditions Once I have created a design, I cut a stencil and then I print each bag individually. This means they are never actually identical and may differ slightly from the one pictured. They are then, individual little works of art! Hi Welcome to saranjutebags we have more customized collection newly arrived like bahubali, lunch bags and ladies lunch bags varieties. 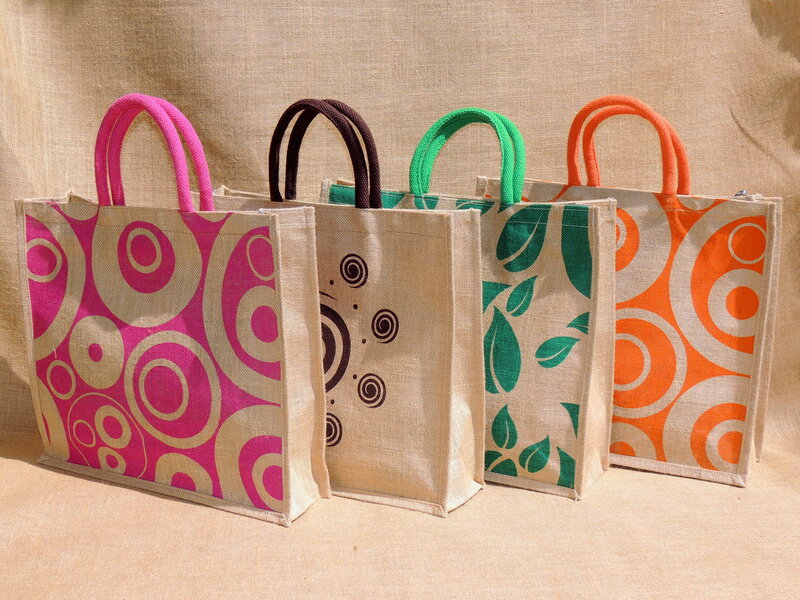 Jute lunch bags under 50 rs, jute bags 100 rs below, jute bags below 150rs, jute pouches under 60rs. This is jute file folder which is the perfect corporate gift for you to keep your documents and it has a big area for branding purposes. Your logo or message can be printed on the front of the folder. We are a leading Jute File Folder manufacturer in India and we have a rich collection of Jute File Folder. We could offer more than15 designs of Jute File Folder. All the images is not here so if you are interested to purchase this Eco friendly Jute Folder then please knock us to check our other designs.